#LakmeSchoolofStyle - India's First Fashion Video Magazine. In a fashion savvy era, where trends change almost every week, it is really difficult for fashion conscious people like me and many more to keep up with these trends. Of course you have fashion magazines and fashion blogs to keep up with the latest and ever changing trends, but then they are not all inclusive. Plus the fashion magazines may portray fashion that is unaffordable to many, while the fashion blogs may be too personalised and not everyone may relate to them. In such a scenario, wouldn't it be really nice if we could hire personal stylists, who are not only stylish and knowledgeable but have a cool take on all things fashion and trends? You think I am kidding? Absolutely not. #LakmeSchoolofStyle in association with #Fame is India's first fashion video magazine. Lakmé School of Style is a first of its kind show that will not only bring the newest trends and happenings from the fashion world but in the process will also create new age fashionistas and idols. 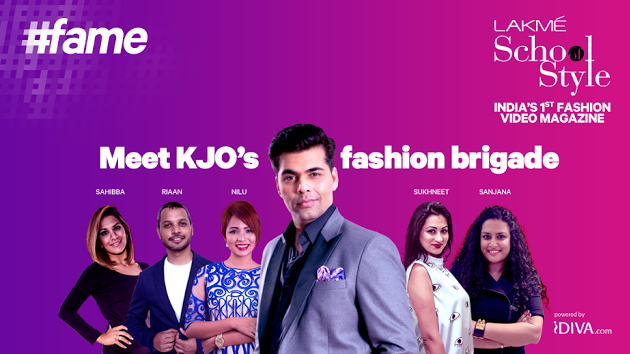 A fashion brigade led by Editor-in-Chief, Karan Johar himself will bring the fashion news, views and events from all over the world to the internet screen. And #fame..need I say more? #fame is a brand, it is a platform, it is a movement that brings talented individuals together to do what they love the most and enjoy their moment of #fame with vlogging. Musicians, comedians, chefs, fashionistas and many more.. #fame is home to all such talented people. I started with one video, and couldn't stop watching it for an entire hour. Every video was unique, practical and upped my fashion knowledge a notch higher. I felt Sahiba's video was made for me. I have been sporting short layers for the longest time, and every time I want to dress up, all I can do to my hair is blow dry them and leave them open...the way they are. But this video changed my perception of short hair and showed me so many easy and elegant hairstyles that girls with short hair can sport. And far as Riaan's video is concerned, I think this one is a must watch for all the men around here. Groomed men is a specie that is really rare and with this video, I feel more and more men will understand that you don't have to spend hours in front of the mirror or spend huge bucks to achieve a perfectly groomed look. For more videos subscribe to #LakmeSchoolOfStyle now. Let me know, which video you liked the best.